Tonight’s Road to Show is a themed show! That’s great as these shows are usually a bunch of tag matches with or two singles. We are still getting a bunch of tags (well, three) but we’re also getting a best of five series tonight between New Japan and Bullet Club. It was your standard NJPW eight man tag opener. Good, solid action that set the tone for the night. It was cool in that you saw some people interact with each other where it couldn’t happen under normal circumstances. For example, Liger and Ishii worked together and it was actually pretty interesting. Kushida worked with him briefly as well. That would be a very interesting match if it were ever to happen. Yano was only in there briefly, doing his usual deal with the Finlay made his comeback but RPG Vice countered. Romero took out Kushida with a dive, then they followed with the dropkick/dudebuster combo for the win. Why did Shibata agree to tag with Captain New Japan? Eh, I always bring this up but someone should go to management and mention CNJ’s never, like, won a match. If this were real he'd be canned a long time ago, old or not. The Old Lion Squad beat up Shibata and isolated him early. Kojima managed to thwart Taguchi’s hip attacks. It was Nagata who worked with CNJ towards the end. All of Shibata’s team mates tried to help take down Nagata but it was no use as he got the backdrop driver on CNJ and pinned him. It wasn't that good or even interesting. Wrong team dynamics here. Tenzan and Shibata got into a big brawl after the match, with Tenzan pelting Shibata with chairs as his team mates tried to stop him. 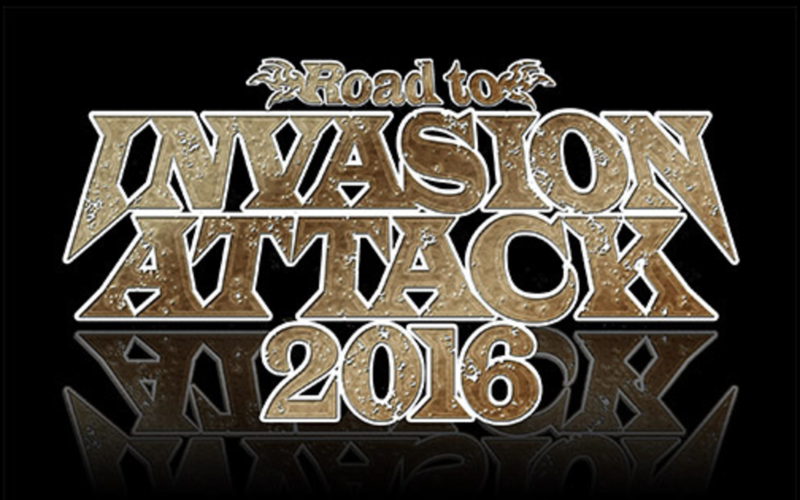 They’re competing for the NEVER title at Invasion Attack. This is Hall’s first singles match in New Japan if I recall correctly. If not it’s been a very long time. He’s still green in spots but has tons of potential, has good facials and has improved dramatically in the last year. They had a short, but pretty solid back and forth match with Elgin getting the win, pinning Hall with a powerbomb pinning combination. This was pretty good. White is really good technically at this point. Crowd was kind of quiet early, but got into it towards the end, especially when White was making his comeback and was getting all the close submissions/near falls. Omega cut him off with a snap German suplex then a knee strike, pinning White to even things up. Yujiro seems to not even have Mao or his cool theme song anymore at this point. He just came out to the usual Bullet Club theme. Tanahashi came out but Yujiro jumped him immediately. This was fine - short, but was probably the right amount of length. Yujiro low blowed him at one point and got a near fall with a cradle. Yujiro bumped into the referee towards the end of the match, and Tanahashi returned the favor. He gave him the sling blade, high fly flow, boom, there’s your winner. I liked this match in the sense it told a nice story. People were into Honma’s comebacks and were totally behind him. Honma fought hard early but Fale took him to town and dominated, as he’s the big giant of the promotion. Fale beat him up forever and ever until he escaped the Bad Luck Fall and scored a roll up for a nearfall. Fale gave him a GIGANTIC lariat in retaliation, then pinned him with the Bad Luck Fall. This is the deciding match in the best of five series as they’re tied with two wins each. This wasn’t really anything interesting. Not terrible, but I couldn’t get into it. Just a lot of back and forth brawling with no real significant heat. Tonga did do a ref spot and a gun stun at one point. Makabe fought him off, hit the spider German suplex and was going for the King Kong knee drop when Tonga Roa came in and shoved him off the top rope, then continued beating him for the DQ. So technically, the New Japan guys win the best of five battle. Roa and Tonga beat up on Makabe (Honma was destroyed in the previous match) as young lions try to intervene, but Roa throws them around easily. They laid out Makabe one more time with a modified double team version of Tonga’s finish (waistlock DDT). Tonga cut a promo saying they are GOD - Guerillas of Destruction. Cool name. Don’t know if this team will work, but we’ll see. It’s something new at the very least. Ingobernables were mean early with Bushi choking out Yoshi-Hashi and Naito beating up Gedo all the way back to the backstage area. What’s funny here is that now Crowd were into Goto as opposed to booing him, I guess because he finally joined Chaos. He and Evil worked pretty good together. Okada and Naito had some good back and forth before he tagged in Yoshi-Hashi. He made a good comeback and battled out of the Destino and walloped Naito with a lariat. There was another ref spot. That’s like three matches tonight where there’s been some sort of ref bump, pretty excessive and unnecessary. This allowed the heels to lay everyone out and pin Yoshi-Hashi for the win.